Celebrate Valentine’s day in style with these fizzy treats. Bath bombs make the ultimate surprise gift for your loved one or the most relaxing treat for yourself! I’ve made a few batches lately, slightly tweaking last year’s recipe. Let’s get started! Mix the dry ingredients in a bowl and stir until well combined. Mix the wet ingredients then combine it with the dry. Do this until the mixture starts to clump together. Spoon the mixture into your molds and press down firmly. Leave them to dry and set overnight. Carefully pop them out to remove them from the molds and run your bath. Hop in and enjoy the scented bubbles. 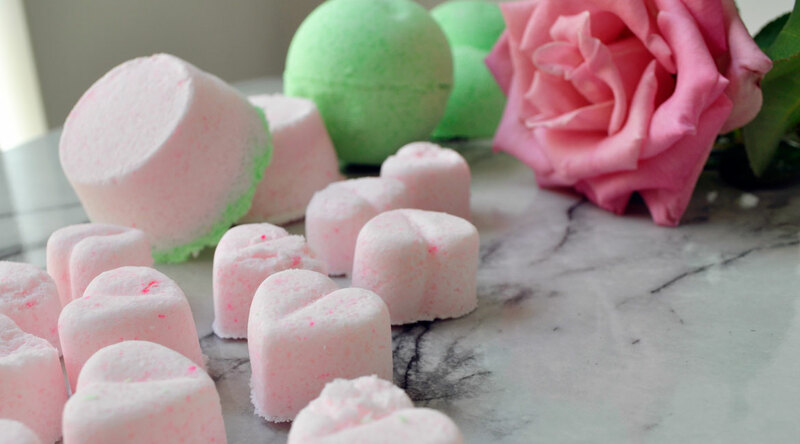 Have you ever made bath bombs? Let me know if you’ll try making this recipe. Thank you so much Sameera, they turned out pretty awesome! in my dreams i could attempt this .. Sorry for the late reply hon, the olive oil adds a moisturising effect and The lavendar oil aids in relaxation. Very Creative, Amy! Happy Valentine’s Day to you! Thanks so much lovely, hope you had a wonderful Valentine’s Day too! OMG how brilliant is this? I need to make bath bombs! Thank you so much for sharing this! I seriously would love to try but I haven’t found molds that I like and I would need to get the coloring and a few more ingredients such as essential oils lol. These look gorgeous though! Nice! I get some from lush for my kiddo too. Loves to play in the water and loves bubbles even more. This is so so cute.I have to try this out…beautiful! Those are cute! My first bath bombs were not cute. lol I may have to try again. the little heart shape looks so pretty!